This past January I made a big dietary switch and began eating mostly plant based meals. Although it wasn’t completely by choice, I have managed to stick with it and can honestly say I feel so much better for doing so. Cited as a 2018 Food Trend by Baum + Whiteman, it is said that consumers under 40 have increased plant based foods into their diets by over fifty percent. I’m not willing to give up my Sunday night chicken dinners just yet, but I can say that the meals I eat on a daily basis are generally without meat. One of my favorite snacks, which has since become more of a meal, is hummus with vegetables or vegetable based chips. I know, I know, just when you might have thought hummus was on its way out it is showing up again on list after list of 2018 food trends. 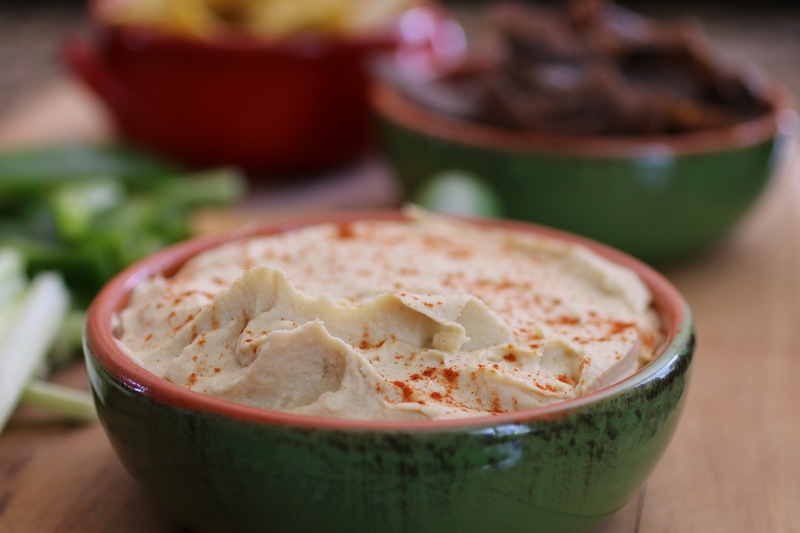 We love to make our own and after you give it a try you won’t be able to eat store bought hummus again….unless it is made by a local small batch producer…we even bend in that case. Before I began I scoured the internet and cook books for great hummus recipes. I like looking for differences. Why do some people use only Ethiopian tahini? Why do some people prefer the juice of two lemons? How much tahini per can of chickpeas? To cook your own chickpeas or use canned? These differences fascinate me and could keep me in the kitchen all day testing different versions- especially this one which I can’t wait to try next. But for now I kept it simple, using canned chickpeas because, to be honest, I had a bit of a chickpea fail a while back using dried chickpeas and I’ve been a little hesitant to return to them. Blend it all in a food processor, adding the reserved liquid as needed to thin out the hummus. Add a little extra paprika at the end and drizzle with olive oil. It is that easy. What is your recipe? We’d love to know some tips to make our next batch even better!